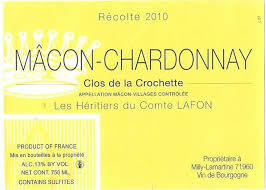 2017 Heritiers du Comte Lafon Macon-Chardonnay Clos de la Crochette - $24.99: Vins Rare, The finest selection of rare wines. Burghound 86-89. "Firm reduction is all that can be discerned today. On the palate the borderline tender middle weight flavors that possess fine mid-palate volume though the finish is decidedly less complex and persistent. This is nicely refined but it's an open question whether it can develop further depth."